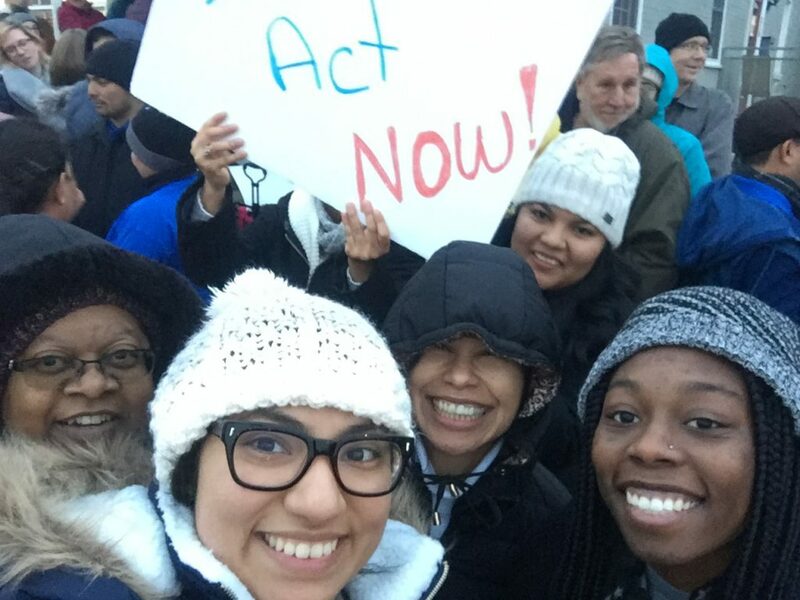 For at least one Eastern Mennonite University student in particular, the Wednesday, Dec. 6 march in Harrisonburg from the city hall to Representative Bob Goodlatte’s office was for a deeply personal cause: a means of permanent legal residency here in the United States. Senior Keyri Lopez-Godoy has lived in the U.S. since moving to Charlottesville from El Salvador when she was age eight. She will graduate in the spring with a degree in elementary education. She was interviewed about her experiences and advocacy work the day before the march by WHSV’s Bob Corso. WATCH Keryi Lopez-Godoy’s interview with Bob Corso. Lopez-Godoy’s status as a beneficiary of the Deferred Action for Childhood Arrival (DACA) program expires in 2019. The program was ended by President Donald Trump in the fall. 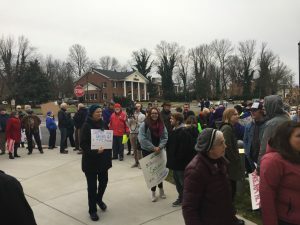 Wednesday’s rally and march, led by Virginia Organizing, was in support of the proposed DREAM Act, and Temporary Protective Status (TPS) for foreign workers. Marchers in downtown Harrisonburg, Virginia, on Dec. 6. The DREAM Act would be a permanent solution for Lopez-Godoy and the estimated 800,000 other residents able to work and study in the U.S. legally due to the DACA program. TPS, which Trump has begun lifting, has protected some 300,000 workers. Lopez-Godoy and other EMU students formed the campus’s DACA Dialogue Planning Committee after Trump’s decision to end the program. The group has hosted several advocacy events. Lopez-Godoy has spoken publically about her experiences in a chapel service, and as part of a story exhibit on campus. Read WHSV’s coverage of the rally and march. You did a good job Keyri !!! Congratulations for you and everybody participated in this event. God Bless.